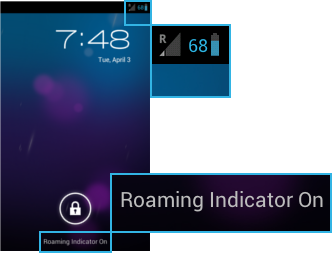 In rare cases, users have complained that their Docomo smartphone (Sharp or other brands), still shows the "R" sign for roaming, although the phone has been SIM-unlocked. The phone "thinks" it is roaming, although a local operator SIM is being used, and operator data will not work unless you have enabled "Data roaming" under Settings > Network settings > Mobile networks. To solve this problem, you need to replace your SIM card with a newer one. And for newer Sharp models (but maybe also for any other newer smartphone), the new SIM needs to be a 128-bit card, or the so called "3G" cards, not the old 64-bit cards (or "GSM" ones). This has been successfully found to solve the problem on an SH-07E. Please send your feedback if it has worked for your model.